Feel the fear but don’t stop! To fear is to human. The natural instinct to run away from discomfort or pain is the brains way of protecting us from danger. There is no way of growing that is not accompanied by some form of discomfort or another. Growth demands that we go to places that we have not gone before, meet people that we have not met, do new things, embrace new perspectives, acquire new knowledge, break barriers, shift attitudes and basically get disrupted in more ways than one. All these things are uncomfortable to do especially when we are doing them for the first time. Change is never easy. The fear of the unknown can make one stuck to what is familiar sometimes even when it is absurd. Think of a mugger who wakes up every day scheming and conniving on how to rob people of their hard-earned money. Think of a prostitute waking up every day to his or her trade mostly because that is what is known and familiar to him or her. Think of yourself waking up every day to a job that you don’t like or staying in an abusive relationship. I am not being judgemental but isn’t insanity doing the same things and expecting different results? 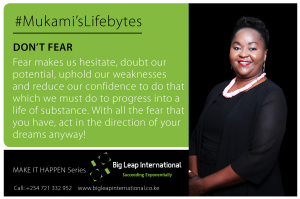 My prayer today is that you will choose to feel the fear but still push to do the things that you must do to achieve your goals. Go ahead and make that call to pitch your business, ask for a promotion, apply for a new job or bid for a tender, ask for help, speak your mind, preach in church, start a business, invest your savings, write a book, start your health regimen, take an HIV test or a pap smear, speak in public, propose a marriage or open the dance-floor. All these things will feel awkward the first time that you do them but soon or later they will be no big deal. Research done shows that only 8 percent of our worries are worth our while. A whopping 92%t are pure fog with no substance at all. To call a successful person lucky is naïve. Equally misleading is to call a slacker unlucky. I know this kind of thinking may seem outrightly arrogant and conceited. I mean who sets out to be poor or is happy to sleep hungry? Isn’t it everyone’s dream to have bountiful wealth, experience energy and well-being, have connected relationships, a successful business empire or career and a happy family? Wouldn’t we all want to thrive in our passions. live epic lives full of joy as we impact positively to the communities around us? Wouldn’t we all want to experience the Joy and peace that comes with being where we want to be, with the people that we want to be with and doing what we love doing? Who does not want to live a life of substance, connect with God and humanity and leave a legacy? Isn’t it rewarding to set great goals and then work and achieve them? I don’t know about you but this is my definition of success – To set a big, hairy and audacious goal in each sphere of my life and then have the pleasure of achieving it. I totally subscribe to the thinking that success has a formula. My way of stating that formula is: SUCCESS = VISION + DECISION + BELIEF + ACTIONS + CONSISTENCY. May be there is more to add like FOCUS, PASSION, ZEAL, ENTHUSIASM, RESILIENCE AND GRATITUDE even in as much as there is more we can subtract such as FEAR, LAZINESS, PROCRASTINATION e.t.c. VISION: It’s the dream that you have. That clear and concise definition of the end that you have in mind. It could be one overarching dream in your life. Such as – Experiencing an abundant life full of integrity, love, laughter and leave a legacy and then supported by specific goals (yearly, monthly, weekly and even daily) in each aspect of your life such Earn KES. 1Million a month from your investments, Weigh 70kgs in body weight, Experience God through daily meditation, reading the bible and prayer or share dinner with your family every evening, Own a five bed-roomed house overlooking beautiful scenic views e.t.c. What is your vision and what are the goals that are driving that vision? DECISION: This is about deliberating making choices that support your goals such as saving and investing rather than spending, exercising and eating well and generally creating habits that serve us well like medicating, self- development, connecting with our families and choosing to get rid of our bad habits. We know them! BELIEF: This is three-pronged: Believing in God, your maker, who created you in his own image to exercise dominion and control over all flora and fauna. Secondly, believing in your cause and course and being convicted, with compelling reasons, to follow your path and thirdly believing that you, despite all the challenges and shortcomings that you have, can do it. ACTION: Beyond your belief in possibilities, it is about going flat out with integrity to manifest your dreams. Working at them whether you feel like it or not. Taking the risk to venture where you have not gone before. It involves being afraid but doing it anyway. This is where many of us go wrong. We develop beautiful plans and we don’t act on them. We dream big dreams but when it comes to sweating it out, we sleep on the job. Pathetically we have all sorts of reasons (read excuses) to explain ourselves away. CONSISTENCY: It is easy to experience a moment of inspiration and jump into action and then wither as soon as the sun shines. It takes guts to report to duty every day; to pursue your dreams especially when you are still laying the foundations and there is nothing to show for results. Working to improve on the quality of your life is a full time job. Staying single-mindedly on that cause without being distracted by side-shows or giving up is paramount. The test to you today is to check how you are doing on all these areas. If you have the courage go ahead and measure each area on a scale of 1 to 10 then start working diligently to improve on areas where you fall below your expectation. Above all knowing that SUCCESS IS PERSONAL. It is not you comparing yourself with others but ABOUT HOW YOU MEASURE AGAINST YOUR VERY OWN BENCHMARKS OR GOALS! If you made it to the end of this post, congratulations! I am almost confident that many quit quarter or halfway. To come this far probably means that you are hungry to realise your dreams. Work at them without relenting and cheers to better results in the coming days and to a better future! At one point in our lives, we go through painful experiences. People hurt us, our relationships dim, a promising business venture goes under or our career stagnates. Sometimes we do things that we regret, hurt other people or even say things that we wish we could recall. Often times, we procrastinate on opportunities and they slide by making us regret why we did not grasp them. We lie or even cheat to cover our backs. We get disappointed even as we disappoint ourselves and others. While we all would love to have clean closets with no bones in them, the truth is they do exist and sometimes their bad smell linger for a while. Simply put, we make many mistakes and we fall short. This is an invitation to healing. The truth of the matter is that apart from taking responsibility and apologising to ourselves and others, the past remains a school where we can draw lessons both positive and negative. 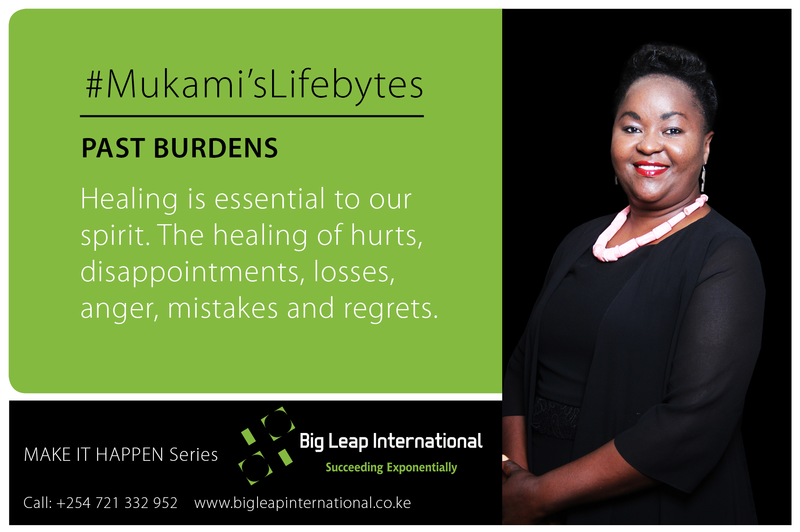 In order to appreciate the present and take advantage of the future and the great fortunes that they both portend for us, we must constantly seek to heal from our past burdens and pains. Healing is not about pretending that the past did not happen rather it is about embracing ourselves and working towards a better quality of life into the future for ourselves and those around us. Healing is knowing that the past is part of our story and leverage that to make us stronger and wiser rather than condemn us to lifelong shame and guilt! We all would like to make huge leaps in the direction of our dreams. We would love to wake up one day and do something phenomenal and in return speed bullet in our progress path. For example, many of us would like to exercise for a week or take a magic pill and enjoy the benefits that would come with dropping a couple of pounds in body weight. While we all want positive results quickly if not urgently, it is educative upon us to realise that results either positive or negative accumulate with time based on our habits or our everyday actions or inactions. If you save and invest one hundred shillings (one dollar) a day in five years, it will have accumulated to something significant, On the reverse side, if you neglect your health or relationships for five years, there will be negative accumulation which will take time and effort to reverse. My submission is that for progress, it is the small but consistent actions that count most. Don’t wait to make the magical big leap. Purpose to do three things everyday towards your key goals however small and you will realise the magic of small consistent actions. With time, you will gather the courage to take bigger risks once you realise the positive results that you are getting.